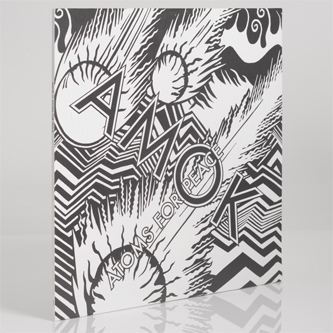 **Double LP including CD version of the album** Atoms For Peace finally roll 'Amok' into place, exercising the electronic pop imaginations of Radiohead's Thom Yorke & Nigel Godrich, RHCP's Flea, and dab-hand drummers Mauro Refosco and Joey Waronker. Recorded between LA and London over the last year or so, it builds on the promise of single teaser 'Default' and the Judge Jury, Executioner one with seven new tracks taking their sound to places we hadn't previously foreseen. Opener 'Before Your Very Eyes...' unexpectedly weaves tight Afro-guitar lilts and drum patter to Thom's affected croon to great effect, and 'Ingenue' diverts that rolling Afrobeat vibe somewhere icier, synthetic and with a taste for bittersweet dissonance. 'Dropped' is where Thom really gives a nod to one of his favourite electronic bands, Modeselektor, and at the album's centre the futuristic ambition of 'Unless' strongly points to Autechre's influence. Again, the twin spirits of Tony Allen and German electronics loom large over 'Stuck Together Pieces' and the frayed, jazz-wise experimentation of 'Reverse Running', while the ghostly, swinging 2-step of closer 'Amok' engineers a beautifully forward-thinking pop fusion blessed with the electronic jazz finesse of Four Tet and the immersive post-rave arrangement of Burial. And yet, while all those influences are hardly masked, they're employed with a subtly unique, pop-sharp precision that will likely shock and compel a lot of folk who might not normally listen to AFP's individual outputs.